Hallowe’en Trivia – Shell out Shell out!!!! 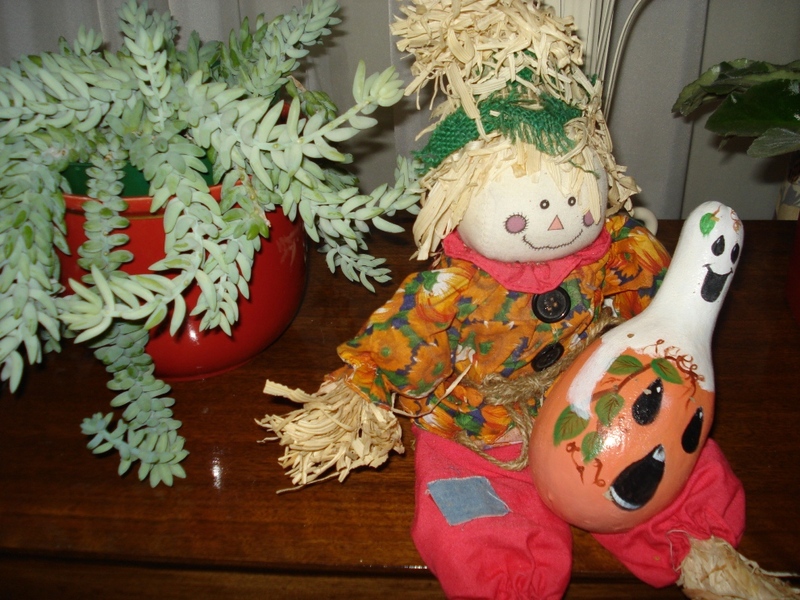 I hope for those who are taking their little ones, whether children or grandchildren, out for Hallowe’en you have good weather and fun! Around here you never know what the weather will be like. It can be beautiful…rainy…snowy…another element of surprise! Maybe you’re off to a Hallowe’en party….what are you wearing? I love those! Because of the unknown, Halloween is the one of the most captivating holidays, often celebrated by both adults and children. ‘Halloween” was made in only 21 days in 1978 on a very limited budget. While the setting for the story is in Illinois, the license plates on the vehicles have California plates. And the 200th Post Giveaway Winner Is….. The slip she pulled was our DAWN from Dawnsdaybreak.blogspot.com. I was so happy that I was going to be sending the giveaway to her because as I explained, I “knew” her. 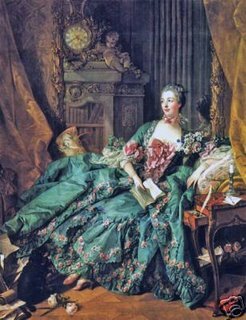 I tried to explain our Blogland and Girls in My Circle etc. to my co-worker. I think she understood as best she could. CONGRATULATIONS Dawn! I hadn’t shared what the giveaway was going to be because #200 post came out of the blue it seemed but I did say I knew it was going to include my handcrafted items. I’ve sewn a tote from Michael Miller fabric “Falling Dogs” that Dawn can carry her shoes in, or her books or whatever she’d like and a little snap change purse or whatever she’d like to slip into it. Because I’m in Canada I sent her the latest edition of 2 Canadian magazines I have had a subscription to for years, “Canadian Living” and “Chatelaine”. I thought she might be interested in a couple of Canadian ones. There is a little heating pot and a jar of a wickless soy candle scented “Coffee Brulee” I’ve made. It smells yummy once it begins to liquify. 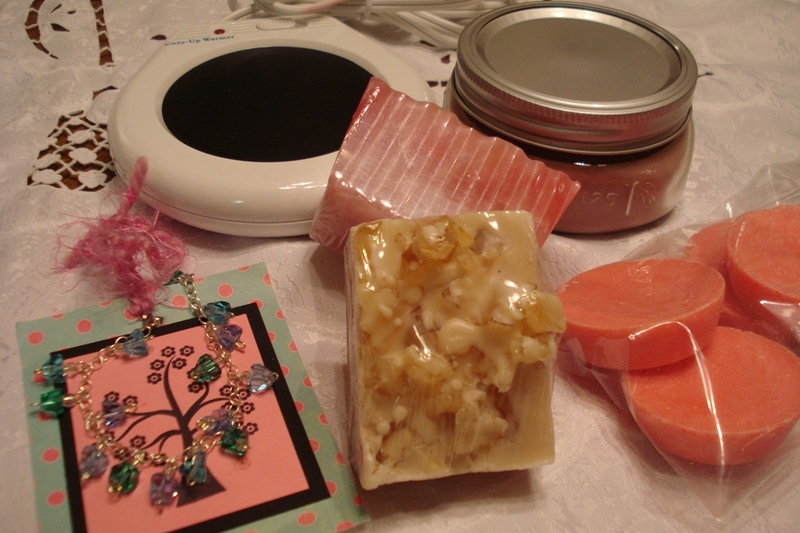 I’ve included 4 of my Strawberry Rhubarb soy wax tarts she can melt in a jar on the melting pot as well. I beaded a “Forest Breeze” bracelet which is on a lovely Tag made by Shelly I purchased from Lemontreestudio.etsy.com. I’ve included 2 bars of my handcrafted soap (Cranberry Peach Vanilla and Coconut Cream Fuzz), a purchased Faith Angel to watch over her or one she may want to put on her Christmas tree. 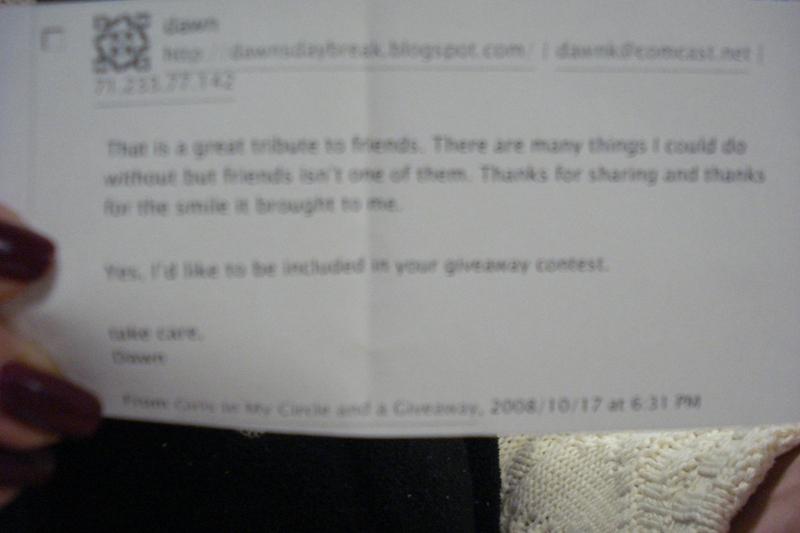 I hope you’ll like them Dawn. 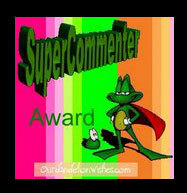 Thank you Dawn and thank you to all my friends here on Blogland. Thank you for visiting and sharing and inspiriting. Dawn if you’ll email me your address I can ship your gifts to you! I’m taking my mom for an eye specialist appointment again after work and she’ll be spending the night at my place. On Friday I’m heading across to the Love Bunny’s. I’ll be away from blogging until I’m back on Sunday but I’ll be popping in over the weekend I’m sure. I’ve prescheduled a Trivia for Hallowe’en for tomorrow though. 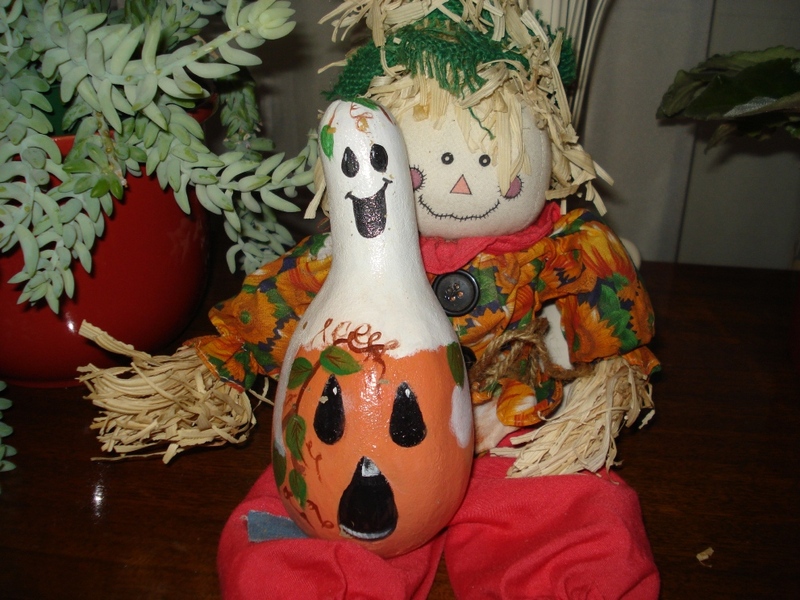 Happy Hallowe’en…oh I did want to share this gourd ghost I painted a number of years ago…Boooooo!! I haven’t even shared what the giveaway yet so I will do that tonight. Good Luck! I wanted to share someone with you… Cute? 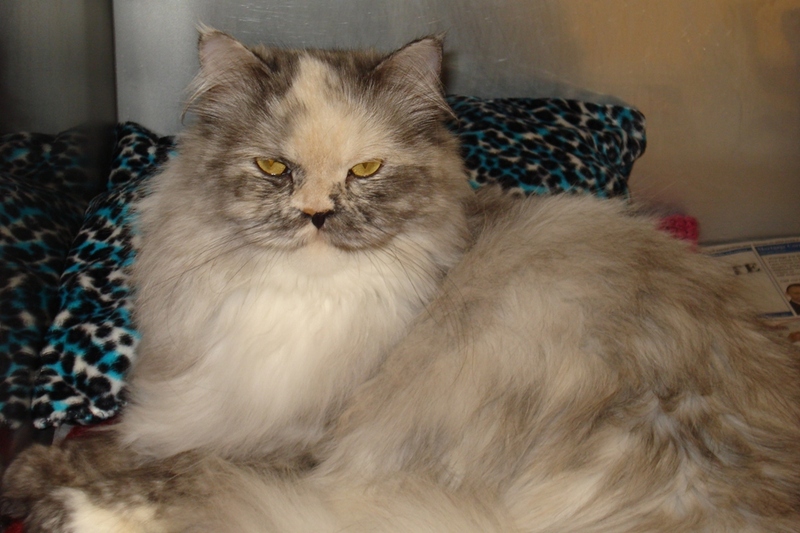 I just met her today, she’s a Persian and lovely. She’s not mine….well at least not yet, but maybe… I’ll share more about her on another post. In the meantime I’m loving her little face. Tuesday, Oct. 28 — Boo-ED and Award Thank you…. 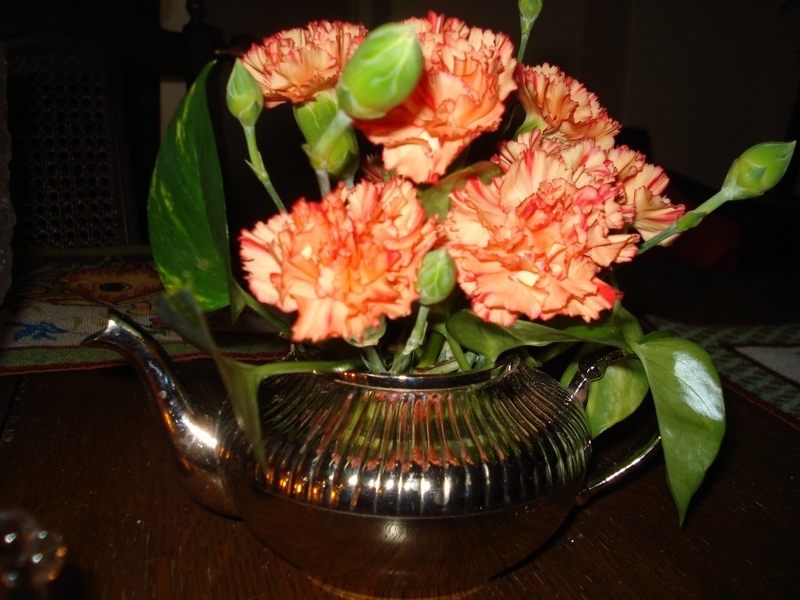 I’m enjoying these fall coloured miniature carnations sitting in my silver creamer. They are such a lovely long-lasting flower. I’ve had them in there 2 weeks since our Thanksgiving. Now go to as many friends as you like and tell them they have been Boo-ED and have them link back to your blog to pick up their prize, the picture, and tell them to Boo their friends. Put the picture in your sidebar so they know you have been boo-ED and send the pic to someone else. 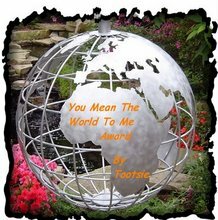 I received an award from Faith from grammafaith.blogspot.com a bit ago for which I am very honoured and I want to tell her thank you very much!!! I try to visit Faith’s blog every day and enjoy reading about her adventures, her lovely family and the stories and joy she shares with them. I am always in awe of her Cow Parade collection. There seems to be one for so many of the special days she shares with us. She is a lovely lady and if you haven’t yet visited her you really should do so. 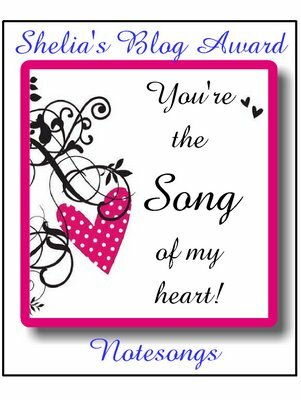 – You may choose 5 people/blogs to give the award to. – Four have to be dedicated followers of your blog. – One has to be a new follower of your blog or live in another country. Stephanie at luluscottage.blogspot.ca and Jeanne at backyardneighbour.typepad.com and Sher at sherscreativeexpresions.blogspot.com and Darlene at darlenesdays-darlene.blogspot.com and Shelia at Notesongs.blogspot.com who make my day special by what they write on their blogs and in the comments they leave for me. Visit these wonderful blogs and leave them a comment also. This is my 198th post with only 2 more before my Giveaway for my 200th post!! I posted about it a week ago Friday. Let me know in your comment that you would like to participate if you haven’t already done so and I’ll add in your name! Good Luck!! and that means its Blue Monday hosted by Sally from SmilingSally.blogspot.com. If you haven’t visited on Blue Monday before be sure to click on Sally’s blog to see who is participating today. Visit the love Blue Monday blogs on her list and don’t forget to leave a post to show you’ve been there. Enjoy. 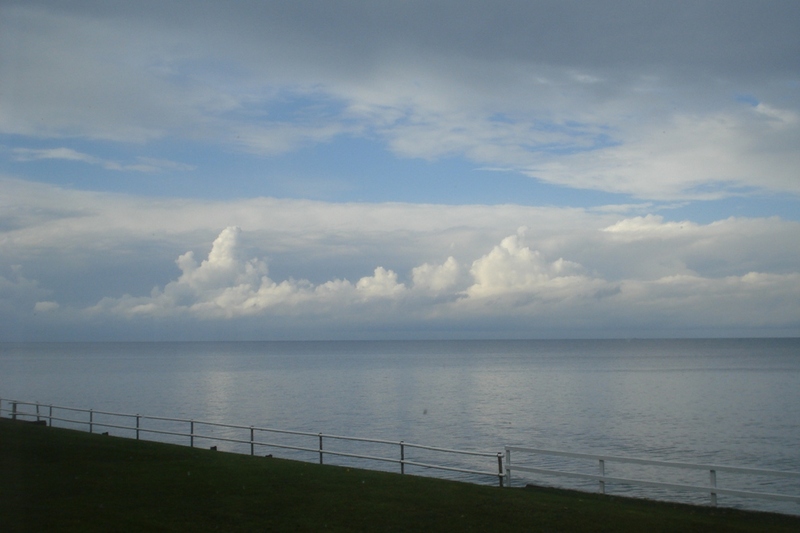 Today I’m sharing the beautiful BLUE skies with their billowing clouds over the morning BLUE Lake Ontario waters. 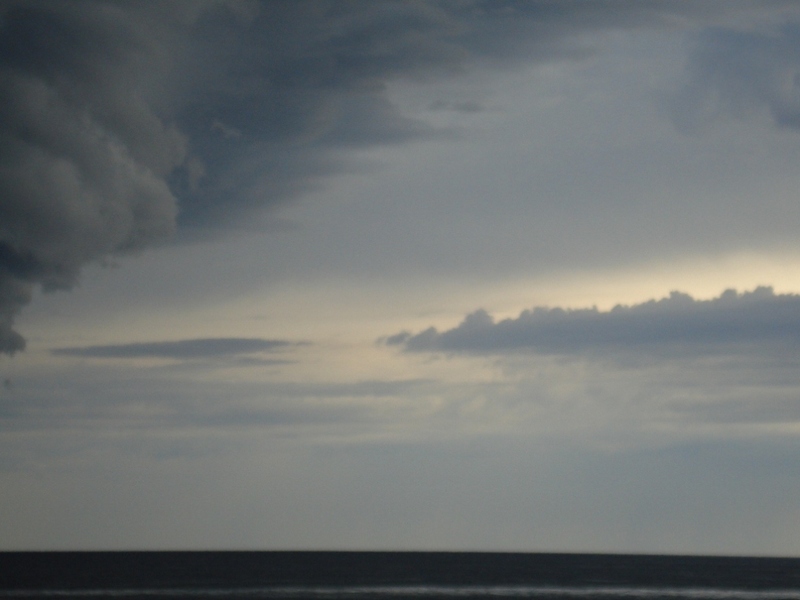 This picture was so majestic and so free-spirited….I stood there for some time just admiring the beauty of it. The clouds were like huge castles lifting up to the heavens. Everything was so peaceful. I took this picture yesterday morning during breakfast. A short time later the skies were no longer so beautiful. They turned a gray and the waters became choppy. Rains followed. This is the cottage next door with its BLUE shutters. 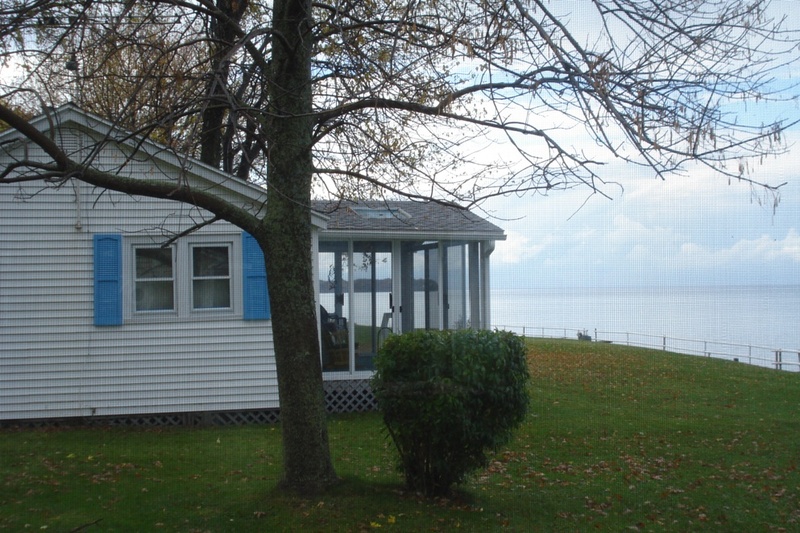 There is a cute little sun porch facing the water. Its a lovely spot to sit and admire the BLUE waters and BLUE skies and boats on the water. Looking past the sun porch far in that direction is Canada where I live. We look there throughout the day trying to compare the weather there by the skies way overhead. Thank you for visiting my Blue Monday. I hope you enjoy all the different Blue Monday pictures offered today through Sally’s blog. Its Pink Saturday again hosted by Beverly at HowSweetTheSound. If you haven’t yet visited all the Pink Saturday blogs be sure to click on Beverley’s site to see where to find them. Everyone you visit will love to receive a comment from you so they know you’ve been there. Years ago my youngest son painted this Easter Egg by waxing down some thread and painting in between. The egg has travelled with me for years and has become more and more precious to me. I can’t recall when he painted it but it must have been about 18 years ago. If you shake it you can hear the “egg” rolling around. 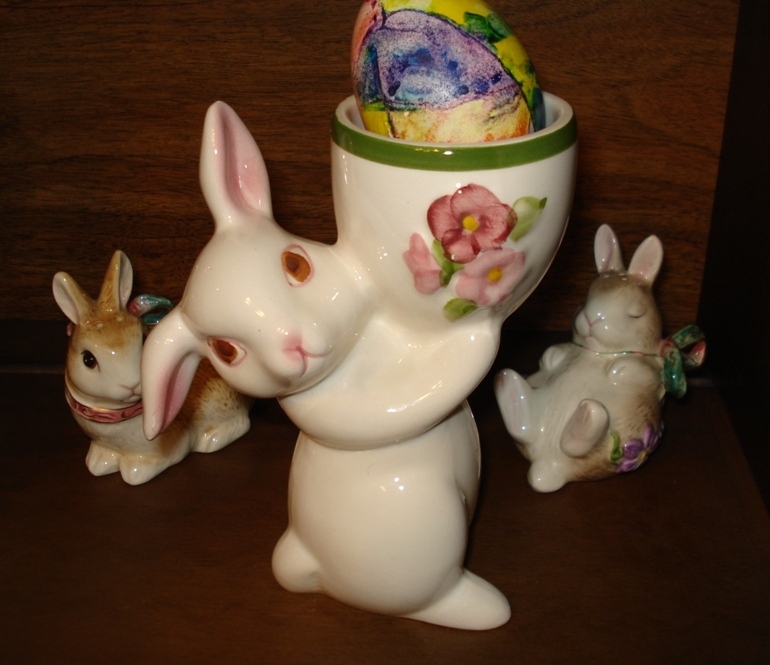 Recently while thrifting I came across this AVON bunny egg cup with its PINK flowers and the bunny’s PINK ears and nose. It is dated 1981. My son was born in 1981 also so it only seemed appropriate the egg cup and egg were meant to be together. This was another bunny to add to my collection. 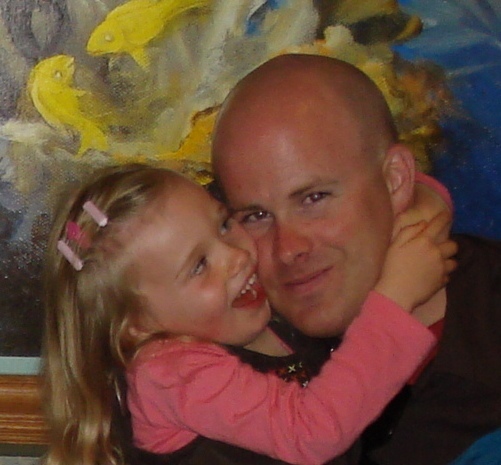 This is my eldest son with his 4 year old daughter Madeline. She’s wearing a PINK sweater which in the picture looks more salmony and PINK barrettes in her hair. You can tell she loves her daddy. His job has him working different schedules and she’ll ask him if he will be there in the morning when she wakes up. She knows if he will be then he’s not on day shift and they’ll have sweet times together that day and her big, blue eyes will dance with excitement. Thank you for stopping by for my Pink Saturday and stories. Be sure to check out the other Pink Saturday sites. 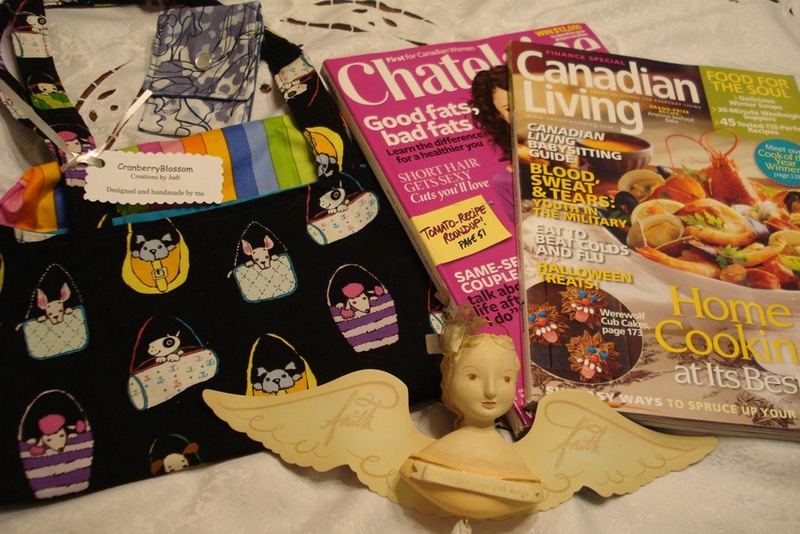 This is my 196th post~ 4 more and I will have reached my 200th and my giveaway! 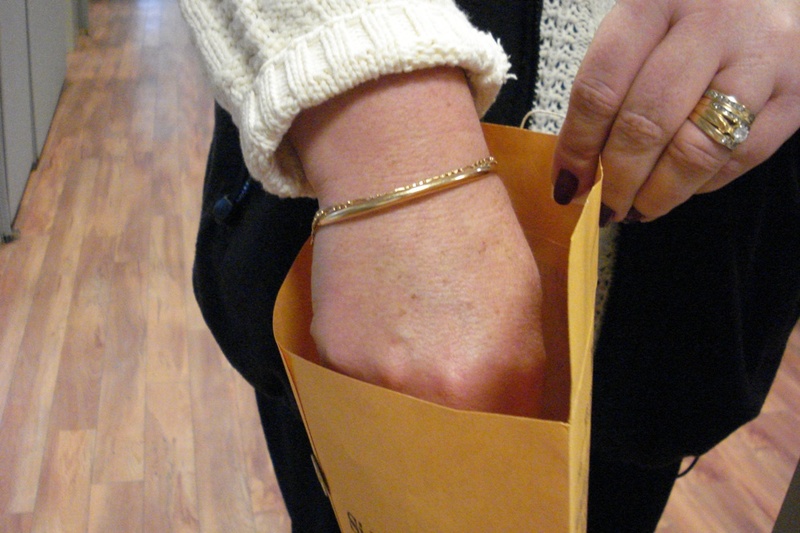 Read about it in my last Friday’s post and leave me a comment and I’ll enter your name….good luck! Its Friday…hooohaaaaa!! I hope you’ve had a good week and looking forward to the weekend. Friday’s just are a special reward. You know when you’re working that whistle can’t blow fast enought to set you free for a few days. They seem to end too quickly and you have the reverse enthusiasm on Monday. At least I find that with working. Here then is a little bit of what I mean….. watch this TGIF. It sure made me laugh! Have a lovely day. Tomorrow is Pink Saturday…..